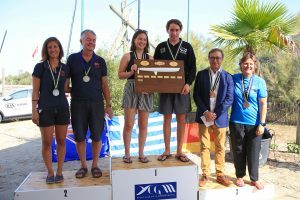 So this was the end of the 2018 Tornado Worlds in La Grande Motte, France. Iordanis Paschalidis & Petros Konstantinidis, GRE1 are the Open Tornado champions for the second consecutive year!! Iordanis Paschalidis and Konstantinos Trigonis were winning this title since 2011 so Iordanis is now a Tornado world champion for the 8th time in a row! Mixed Tornado champions are the youths Estela Jentsch, the 16 year old but also the 2016 Mixed World champion and Daniel Brown, 18 years old Nacra 15 and F18 prommising and winning sailor. Also finishing 3rd overall! 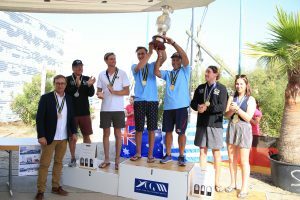 Jurgen Jentsch, the Tornado class President ended the Prize giving ceremony organized at the” Yacht Club de La Grande Motte” by inviting all participants to join him at the 2019 Worlds Championship, to be organized in New Zealand the coming January.